Michael Willock graduated from the UNC dental school and has been practicing for 30 years. If you visit his office there will be one thing unexpectedly missing – fluoride. Willock was part of a group of about 20 that protested the addition of fluoride to the OWASA water supply. Fluoride is commonly added to drinking water in the United States to help prevent cavities and tooth decay. Daria Barazandeh founder of Fluoride Free Chapel Hill-Carrboro, said the group is pushing OWASA to reconsider fluoride. In March, the OWASA Board of Directors recommitted to adding fluoride. The group also protested the cancellation of a public meeting that was supposed to be held by OWASA Monday night. The board has not held a business meeting, which invites the public to speak on matters not on the agenda, since May 25. According to an email sent by board chairman Robert Morgan, the August 24 meeting was canceled because there were no items on the agenda. “I think they caught wind that we were organizing a lot of people to come to the meeting and they didn’t want to deal with it for whatever reason,” Barezandeh said. OWASA fluoridates water to the level of .7 of one-part-per-million. The federal limit is 4 parts-per-million. The annual cost of fluoride for OWASA is $25,000. The OWASA budget is over $40 million. So glad there are citizens calling attention to the issue of forced fluoridation of water. I am surprised and aghast that a progressive town like Chapel Hill is so behind the times in recognizing the health hazards of fluoride. It is poisonous, even in small quantities, there is no evidence that ingesting fluoride has any beneficial effect on teeth, but plenty of evidence of the deleterious effect to the body. People need to research the background to the fluoridation program. It is a toxic by-product that tax payers should not be funding. Enough chemicals are in public water; they do not need to be adding any more. Thank you for your comment! 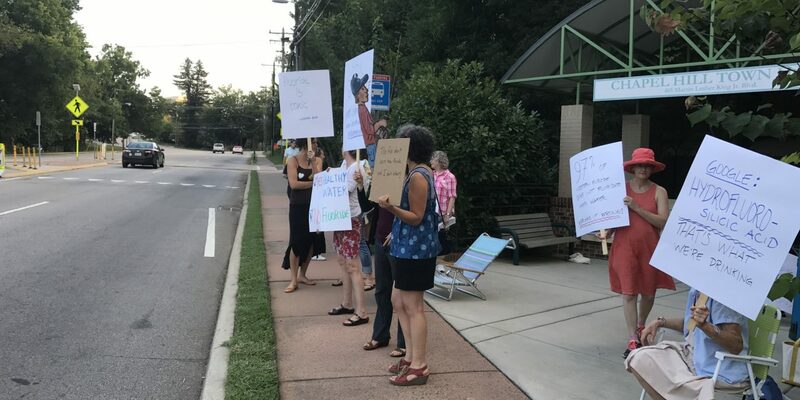 Please join us tomorrow evening (Tue Sept 5th) at 7:30pm at the Carrboro Town Hall at the Board of Aldermen meeting. We need as many voices in support of this as possible to attend.